100:1 The Crack Legacy investigates the war on crack in the mid-1980s and the devastation left in its wake. Host Christopher Johnson shares the experiences of the men and women who were on the frontlines - narcotics cops, ex- dealers, artists, community activists - to help explain the rise in incarceration, hyper-aggressive policing, and police shootings of unarmed people of color that we are experiencing now. 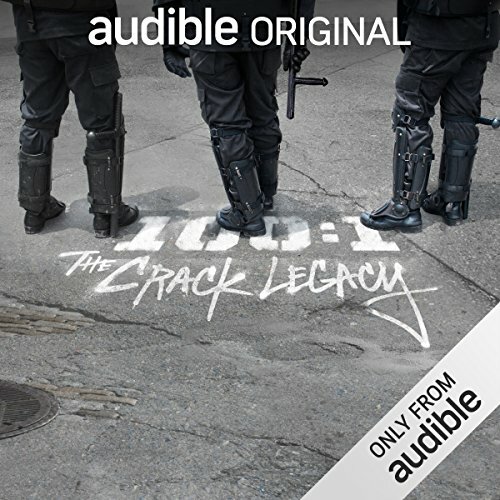 As an Audio Show - free for members - when you add 100:1 The Crack Legacy to your library you'll get all 6 episodes, each with a runtime of about 40 minutes. Drug dealing is something I feel strongly about, the damage drugs are doing to our society and the way that they are ruining lives is something I have always believed can't be under-estimated. So along comes Christopher Johnson with a powerful series that asks us to see another side, another dreadful legacy of the war on drugs. For me he makes a compelling case, indeed an interesting case and I found all of the people whose testimony he used to be credible and engaging. His interviewees all have relevant stories to tell and Johnson himself presents very well. It is however persuasive rather than what I would term investigative journalism. As good as the case he makes is, and we hear from everyone from drug dealers to lawyers and even a judge, it is a series designed to make a point rather than examine something from all angles. As such single witness testimonies are presented to describe events. There is no attempt to present the other side and I felt quite strongly that the impact of crack cocaine usage was played down. Statistics were presented in a very ones-sided manner and none of the witnesses are ever challenged about their views or facts. Don't get me wrong I can fully understand this given the weight of biased propaganda that has existed about the war on drugs for a long time now! And Johnson makes a very eloquent and compelling case about real injustices that have also occurred and how modern politics and serious institutional failings have largely made things worse. In summary while I'm worried about the way that the consequences of crack usage are largely downplayed Johnson has opened my eyes to this equally damaging and important legacy so I'm very glad that I listened to his series. No matter how strongly we feel about drugs society has to remain humane and balanced in its responses. This series holds up an uncomfortable mirror to how well this has been achieved, and I always think that looking in such mirrors has to be a good thing. Well narrated but subject matter is hijacked by a forced and unnecessary racial agenda. Statistics are presented when they suit the narrative but often glaringly omitted when they might not. Total garbage. Little more than a BLM propaganda piece, which poses some difficult questions but fails to accept any measure of personal accountability. Another part of history that has tried to destroy and erase black people. Very sad. It was interesting to hear a heavily one sided story but that’s about it. The only thing I did agree with was the overt harsh sentences handed down, but they were not exclusively for black people. The author is blinded by his own bias which reduces the quality of the reporting. The Hart of the matter is social and has people giving into temptation and making bad decisions and paying massive prices for them. You will be stupider for listening to this. It's amazing how they can blame everyone else for their own behaviour.